Saturday, February 11th at 2:00 pm. Topic: "Design Intelligence and the Word of God." Sunday, February 12th at 2:00 pm. Topic: "Creation, God's Timeline, and the Gospel." Both sessions will be held at the Covenant Lower School, 1000 Birdwood Road, Charlottesville, VA 22903. Professor Andy McIntosh (Leeds) holds an emeritus chair in Thermodynamics and Combustion Theory, and has lectured and researched in these fields for over 20 years. He has a PhD in combustion theory from the aerodynamics department of what was then Cranfield Institute of Technology (now Cranfield University), a DSc in Applied Mathematics from the University of Wales and worked for a number of years at the Royal Aircraft Establishment. He is a Fellow of the Institute of Mathematics and its Applications, the Institute of Energy, the Institute of Physics and the Royal Aeronautical Society. A chartered mathematician and engineer. author of over 180 papers and articles, his research has been in combustion in fluids and solids. 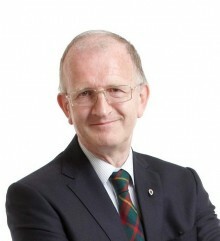 His work has also included investigations into the fundamental link between thermodynamics and information, and in the last few years he has been involved in research in the area of biomimetics where the minute combustion chamber of the bombardier beetle has inspired a patented novel spray technology with applications to fuel injectors, pharmaceutical sprays, fire extinguishers and aerosols. This research was awarded the 2010 Times Higher Educational award for the Outstanding Contribution to Innovation and Technology. Andy became a Christian in 1969 and is committed to a belief in the Biblical Creation account maintaining that Genesis is crucial to our understanding of the Gospel. He has authored the book “Genesis for Today” (Day One, 4th Edition, 2010), contributed to the books “In six days” (Master Books, 2009) and “Should Christians embrace Evolution?” (IVP, 2009), and has appeared on a number of TV and radio programs. He delights to present the scientific evidence for Creation and passionately believes that there is no excuse for scientific minds not to accept the truth of Creation. Favorite talks (most available on DVD) are ‘Creation- so what’s the issue?’, ‘Intricacies of Flight’, ‘Design, Intelligence and the Word of God’, ‘Fossils, Dinosaurs and the Bible’, ‘The Flood and the return of Christ’, ‘Genesis, Babel and the Nations’, ‘Design, Thermodynamics and Information’ and ‘Faraday – man of science, man of God’. He is married with 3 children and 5 grandchildren.